417th Night Fighters site for the purpose of preserving the History of WWII Night Fighters in digital format. Although the 417th NFS is in the website name it will include all US Squadrons of WWII information. The history of the 417th NFS and 418th NFS are in the website as well as hundreds of pictures, videos stories told at the 2007 NF reunion held at MAAM in Reading, PA.
Northrop P-61 "Black Widow" Night Fighter on YouTube Steve Minichiello, aka "xo ox", has assembled a playlist of all the P-61 related videos on YouTube for your viewing convenience and pleasure. Warbird Resource Group -Chuck Gardner's excellent photos. Pacific Wrecks - Justin Taylin's excellent coverage of the restoration - features interview with Gene Strine. Zeno's Warbird Video Drive-In - streaming the whole warbird checkout videos, plus tech drawings etc. The Smithsonian's Widow - photos of the "C" at the Paul Garber facility. Night Fighter! - a first-hand account of the life and times of a P-61 radar observer in the China-Burma-India theater, 2nd Lt. James R. Smith. 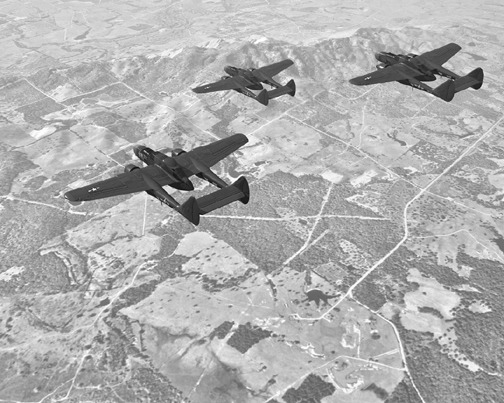 414th Night Fighter Squadron Blog - about the NFS that served in Algeria, Sardinia, Corsica, and Italy. Jan Hermkens Scale Model Planes -featuring, among others, a fantastic 10' wingspan P-61 RC plane. Jill Southfield Greenberg's Blog honoring her father, Logan Charles Southfield, the WWII pilot of MAAM's P-61.